This article is about the faction. For the class, see Blade. The Blades are a small group of dragon hunters, Talos worshippers, and sworn protectors of those of the Dragon blood in Skyrim. No longer are they the secret eyes and ears of the Septim Emperors; hunted and decimated by the Thalmor, they are but a shadow of their former glory. The Blades reformed with the return of the dragons. They are led by acting Grandmaster Delphine, one of the last surviving members, and are based in Sky Haven Temple. The Blades stand in opposition of the Greybeards, and are strongly opposed to the existence of Paarthurnax, whom they perceive as a menace. After the Oblivion Crisis, the Blades withdrew from the public eye to wait for the next Dragonborn to serve. When the Thalmor began to gain a political holding in the Summerset Isle, the Blades began to see them as a threat to any Dragonborn found and a threat to all man-kind in Tamriel. 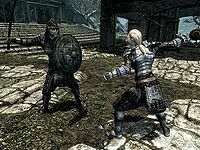 Throughout the Great War, the Blades fought the Thalmor. Many of the skirmishes led to the defeat of the Blades and the persecution of any remaining members. Bloated Man's Grotto became one of the last sanctuaries for the Blades in Skyrim until only two known Blades survived the persecution after the destruction of Cloud Ruler Temple. 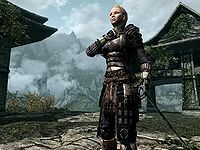 For more information on the Blades before Skyrim, see the lore article. Once Sky Haven Temple is entered during Alduin's Wall, it will become the head of all Blades operations in Skyrim and you may live here if you choose to, so long as you get along with the Blades. You may recruit up to three followers to join the Blades. The first recruit will take the oath right away, while the other two will begin training. The new recruits will train, patrol the area, and live in Sky Haven Temple, their former lives over. The Blade recruits will train with either Delphine, or one of the targets and training dummies; they will always use their preferred skill when training. The Dragonslayer's Blessing may be received from Esbern upon request as well. The Blades will always show an opposition to the pacifist Greybeards, taking a stance that all dragons must be destroyed. The Blades recruits may also accompany you on trips to slay dragons living near dragon lairs. 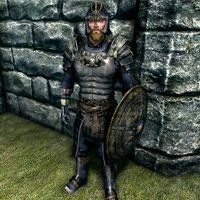 All Blade recruits are given a set of the standard Blades armor, to which they will default in future: this is governed by the Heavy Armor skill, so keep this in mind when choosing recruits. If you choose the person in question as a follower in future, their Blades gear does not appear in their inventory to give back to you (although it does appear if they are killed). They can equip better gear, but apparently only do so while they are your follower, it appears they revert back to using the Blades gear if they leave your service. Also, before the follower joins be certain to retrieve any armor, helmet or shield that you might wish to keep since they are removed from the game and replaced by Blades equipment. They are also given a standard one-handed Blades Sword, although in this case it appears to be in addition to any other weapons they have, and their old weapons are not lost: thus if they prefer two-handed weapons or spells, and they have them, they will wield and use these in battle rather than the Blades sword. A Blade in the Dark: Prove you are Dragonborn to Delphine by slaying the dragon Sahloknir. Dragon Hunting: Kill a dragon at its lair. Dragon Research: Help Esbern complete his research on dragons. "I'm a Blade now, I can hardly believe it." "By my honor, I pledge to rid Tamriel of dragons." "Dragonborn. What do you need?" Any of the followers brought to Sky Haven Temple still function as followers, but will return to Sky Haven Temple after parting ways. If a follower is a spouse, they can still join the Blades. Their home becomes Sky Haven Temple; however, they will only stay there if you decide to live at their house, otherwise they will stay in the home you choose. If a follower is a personal stewardHF, they can still join the Blades. They will participate in Blades' quests, but will return to the property they are in charge of, not Sky Haven Temple. Any Blades members that are slain cannot be replaced. The last of the Blades to survive the attack on Cloud Ruler Temple, Acilius Bolar, took refuge in Bloated Man's Grotto. According to his writ, he later died at the hands of the Thalmor. His unique Blades sword, Bolar's Oathblade, can be found in the grotto under a statue of Talos before beginning the quest Ill Met By Moonlight. Fultheim of the Nightgate Inn possesses a Blades sword.